May 29, 2018 By This post may contain affiliate links. Looking for a simple way to enjoy the delicious taste of s’mores without all the ooey gooey mess? 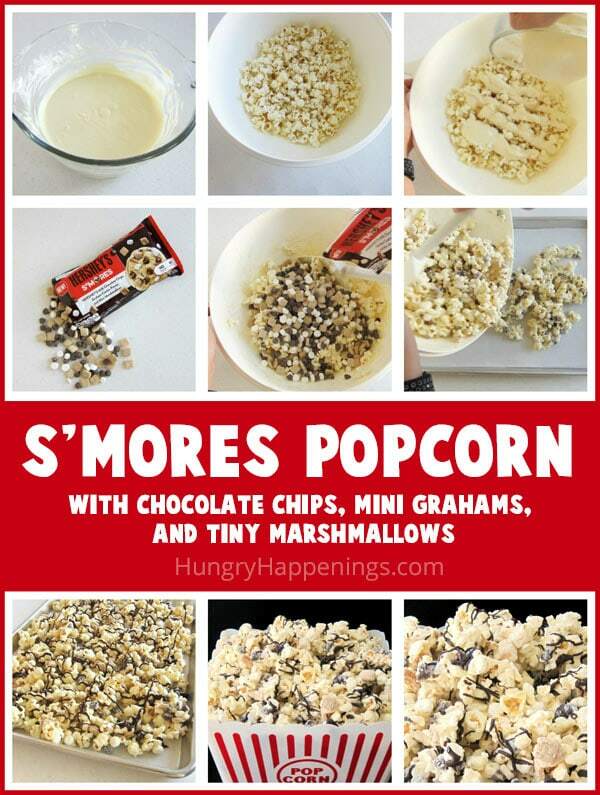 Try making this S’mores popcorn, it is a great snack to satisfy your sweet tooth! You don’t need to light a fire to make this S’mores Popcorn. This summertime snack is so easy to make thanks to Hershey’s S’mores Baking Pieces. Each bag is filled with chocolate chips, mini graham crackers, and tiny marshmallows. Have you seen it on the grocery store shelves yet? I found bags at Walmart, but you can also order them from amazon. I know this new chocolate chip blend was intended to be baked into cookies, but I couldn’t resist sprinkling it over white chocolate popcorn. In the summer I crave the sweet taste of s’mores and love snacking on white chocolate popcorn. Having the flavors combined really makes for a fantastic snack. You can use microwave or oil popped popcorn, but I like the clean flavor of air popped popcorn. Plus the white chocolate sticks really well to the dry puffs of popcorn. 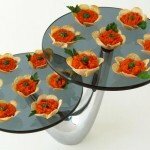 Toss with melted and tempered white chocolate or with melted white confectionery coating (Candy Melts, almond bark). Sprinkle on a bag of Hershey S’mores blend of chocolate chips, mini grahams, and tiny marshmallows. Spread onto a pan and drizzle with melted and tempered dark chocolate or melted dark confectionery coating. You can coat your popcorn in pure white chocolate or in confectionery coating. I write all about the differences in these two types of candies and share how you can properly them in my Chocolate Making Tips page. I personally use Peter’s White Caps, a nice, creamy, flavorful, confectionery coating. It’s easy to melt and tastes great on the popcorn. 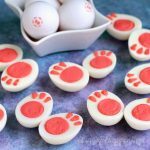 You can find the white caps online or in cake/candy decorating stores. White chocolate popcorn speckled with chocolate chips, mini graham cracker pieces, and tiny marshmallows drizzled in dark chocolate. Pour white chocolate over popcorn. Stir just to coat the popcorn. 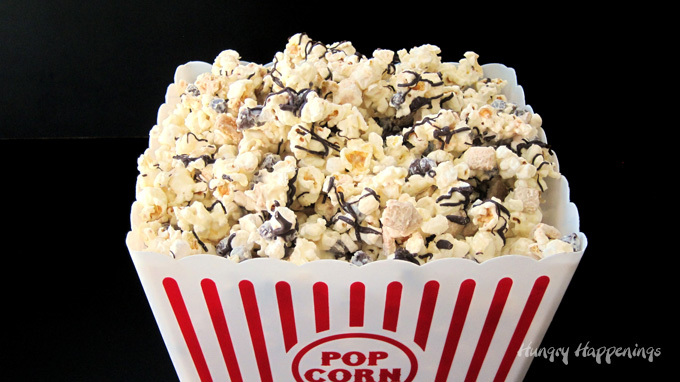 Sprinkle Hershey's S'mores Baking Pieces over popcorn and stir just until blended. Pour out onto a parchment paper lined baking sheet. 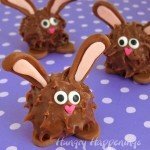 Refrigerate for 10 minutes until the chocolate hardens. Use melted and tempered pure chocolate (made with cocoa butter) or melted confectionery coating (Candy Melts, Almond Bark). 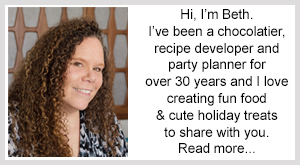 See Hungry Happenings' Chocolate Making Tips page for details. Do not over mix or the white chocolate will begin to harden and it will be difficult to spread out onto the pan. If you can't find the Hershey's S'mores mix, you can add 2 cups total of chocolate chips, small graham cracker pieces, and mini marshmallows. Enjoy snacking on this S’mores Popcorn. 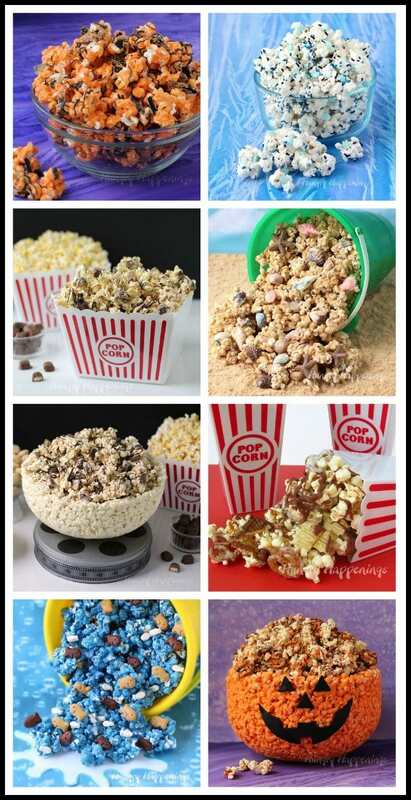 You can find more fun popcorn recipes, here. 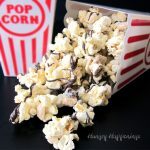 I’m sure your daughter will love this popcorn and you’ll love how easy it is to make. 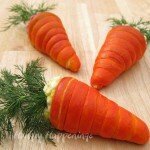 I have seen these and now I know what i need to make with them! I’m hosting a baby shower soon for my newest grandbaby. 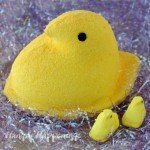 I can make some little popcorn bags for my guests! Thanks for another great idea, Beth! 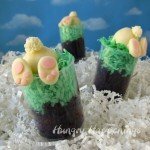 I’m sure your baby shower guests will love their little treats! Have a wonderful party.